I’ve decided when I’ve had a bad day, yoga is my battle weapon of choice. Since I moved to a new part of LA, the choices in yoga are pretty lacking in my neighborhood, so I’ve turned to cooking instead. And why not? I’m way behind on my plant-based cooking course, so I decided to hammer out the risotto exercise. 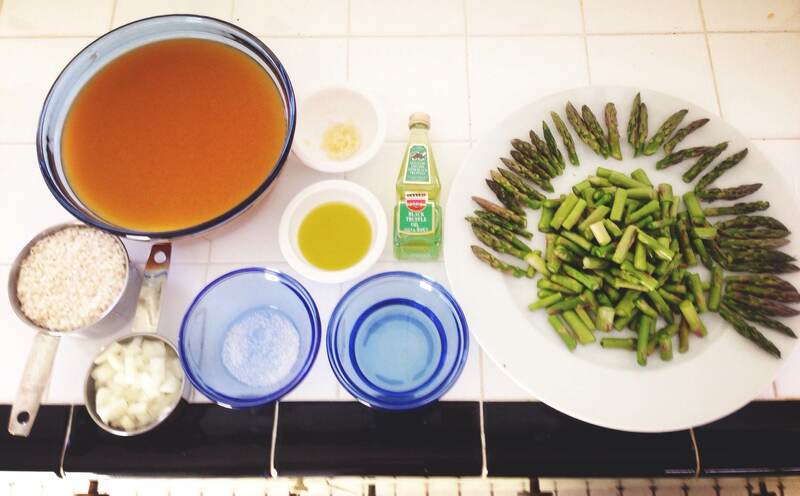 Tonight I tackled the Asparagus risotto. This is actually my second venture in risotto, my first success (or attempt) was with a Carrot Risotto for book club that I hosted, after reading The Fault In Our Stars. Risotto is not for the faint of heart; be prepared to devote over an hour to the perfection of the creamy rice dish. 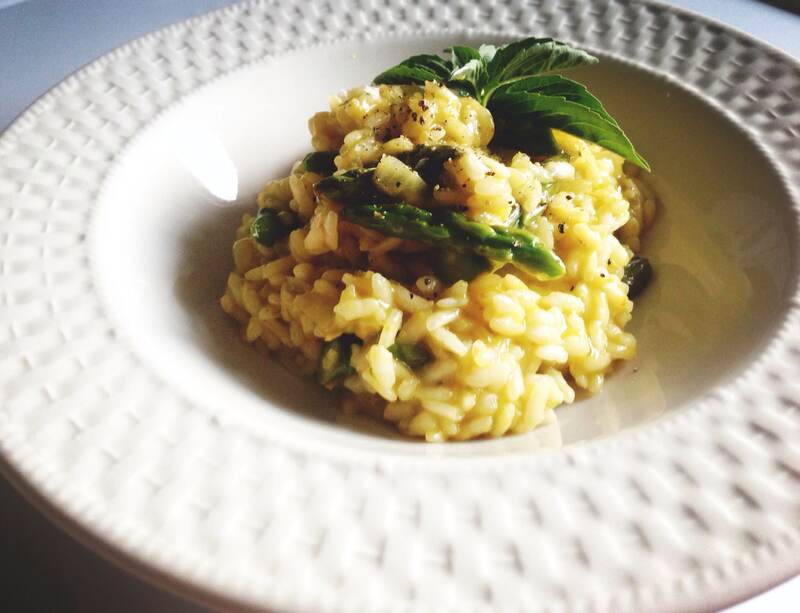 This asparagus risotto is made with an asparagus purée and finished with fresh asparagus tips and truffle oil. To prepare your mise en place, place the liquid into a pot, season with the salt (if needed) and bring to a boil. Once boiling, reduce the heat to low and keep hot. Finely dice the onions and garlic. To make the asparagus purée, first set up an ice bath. Wash and trim the ends off of the asparagus. Cut the tips off of the asparagus about 1 1/2″ -inches long. Set the tips aside. Cut the stalks into 1″ -inch pieces and set aside and keep separate. Cook the asparagus stalks in the simmering cooking liquid until tender and cooked through. Once done, scoop out of the cooking liquid with a strainer and transfer immediately to a blender. Add about 1/4 cup of the cooking liquid and purée for at least 2 minutes until completely smooth. Add enough cooking liquid to ensure the mixture can move freely in the blender. Once smooth, strain the purée through a sieve and into a small pot. Next, par-cook the asparagus tips in the cooking liquid. Once almost done, transfer to the ice bath to stop the cooking process. Drain and set aside. Place the oil into a large, heavy-bottomed pan and heat over medium to medium-low heat. Add the onions and a pinch of salt and sweat until soft and translucent, about 10 to 15 minutes. Next, add 1/4 cup of the hot cooking liquid to soften the onions further. Let the cooking liquid completely evaporate before moving onto the next step. Once the liquid has completely evaporated, turn the heat up to medium-high and add the rice all at once. Stir to coat the rice. Monitor the heat so the aromatics do not burn. Toast the rice for a few minutes until the perimeter of the grains are translucent. Once toasted, add the garlic and cook, stirring just until the garlic is fragrant, about 30 seconds. Deglaze with the wine. Stir the rice until the wine evaporates. Once the wine has evaporated, add one cup of the hot liquid. Stir often to coax the starches out of the rice. Once almost absorbed, add one cup of the asparagus purée and continue to stir. Once the asparagus purée thickens and reduces, go back to adding the hot cooking liquid. Add the next cup of liquid only when the last cup has been absorbed by the rice. Stir frequently. During the cooking process, make sure to adjust the heat so the liquid is always gently boiling. Continue to add liquid and cook the risotto until it almost reaches the al dente stage (or until it is done to your liking). Start tasting the rice for doneness around the 15 minute mark. Just before the risotto finishes cooking, add another cup of the asparagus purée into the risotto to revive the green color. Once the risotto has been cooked to your liking, taste it for seasoning. Stir in a bit of olive oil, if desired. Next, fold in the asparagus tips, cover and let rest for 1 to 2 minutes. Just before serving, add a bit of hot liquid to loosen the consistency, if necessary. Plate on warmed dishes. Drizzle with just a touch of truffle oil. Serve immediately. I like risotto a little more on the sticky side, but proper risotto is more liquidy. You’ll see in my final pic, I’ve gone the stickier route. I left out some liquid, otherwise, add more liquid until it floats on a plate. Thanks, Amy!! Hope you are well.